I’m an avid follower of Coronation Street. I’ve watched it on and off over the years but I would definitely say I’m in my most devoted phase to it ever at the moment. I just got so caught up in the Pat Phelan storyline! But something has annoyed me. In June last year, not long before I found out I might have MS, they decided that one of their characters, Johnny Connor, was to be diagnosed with relapsing remitting MS. The same as me. For those of you that follow Corrie, you’ll know that Johnny has had a tough old time of it recently. His son took his own life, his poor wife couldn’t do right for doing wrong and it was clear their relationship was at breaking point from the stress of it all. His family business was left to someone outside of the family in the will. Then if life couldn’t get any worse, his son’s ex gave birth to a daughter who she gave away to her half sister’s sister. Or something like that. Anyway, Johnny now knows the identity of said baby and is trying to fight for custody of her and is apparently ***SPOILER ALERT*** going to kidnap said baby imminently. Oh and there’s still the tiniest chance that the baby isn’t even his grand daughter. Anyway. Although I’ve said time and time again, MS affects us all differently, I can more or less say with confidence that the vast majority of MSers would not go through his level of stress without experience of a flare up of symptoms, or a full-scale relapse. Now I don’t really want poor old Johnny to have a relapse. I wouldn’t wish that on anyone. But what I do want is for Corrie to have the decency to portray an already misunderstood illness with a touch more accuracy. It seems to me that Jenny (his wife), who at the first sniff of him getting stressed, dramatically shrieks at him to “calm down Johnny, you’ve got Multiple Sclerosis”, is the only person that remembers that he’s got it! I did ask in a group on Facebook with other MSers their thoughts on this. I got quite a big response from people who had been wondering the same thing for weeks. A couple have suggested that they normally relapse after the stressful event, but my argument to that is that the first stressful event was the unexpected loss of his son. Which was weeks ago. Surely by now we’d be seeing some fallout from that? It will be interesting to see what happens to Johnny in the coming weeks – he may be one of those that can hold it together through the stress, and then will fall apart once he doesn’t need to hold it together anymore. Or maybe it will just get forgotten. Johnny could be somebody who has really inactive MS. Some people have it but it’s years between relapses. 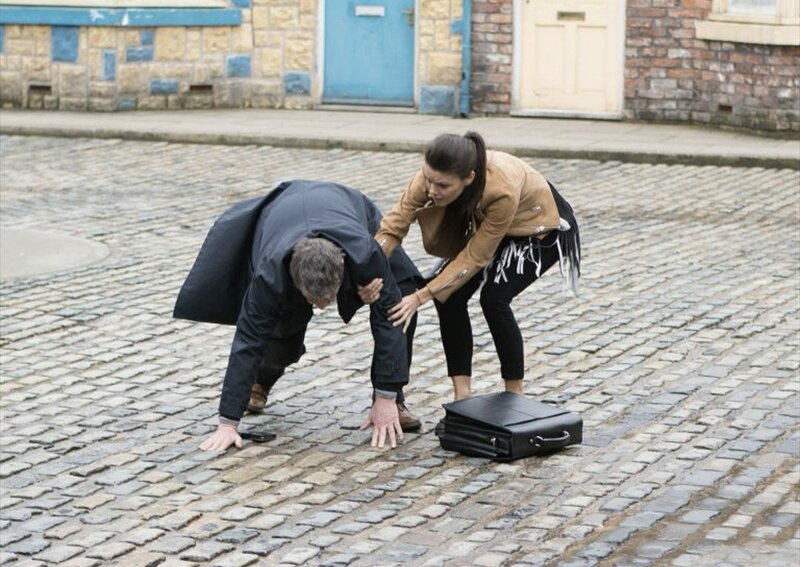 My question is, what are they (Corrie) trying to achieve? If it’s an awareness of the illness, although it’s useful to be aware that some people are diagnosed with MS and it never really (or very rarely) resurfaces, I feel that right now it’s not the right balance. If you want to tackle an invisible illness, you need to give it a bit more than somebody reminding the character, and viewers what he suffers with just because he’s got a bit stressed. In my view, soaps are in a unique position and have a social responsibility to portray these issues. I just wish they’d do it accurately. I’d be interested to hear the thoughts of others with RRMS on this one! We’re all different so it’s always good to get another perspective! I’ve been screaming at the telly since his diagnosis!!! This poor chap has had more crap thrown at him in a few months than most people have in a lifetime. Even if he doesn’t have a full blown relapse, some worsening of his symptoms will do. But to go on physically, without so much of a wobble, is poor script writing, and very unfair to those of us living with this hideous disease. I agree 100%. They’re not portraying what it’s actually like at all & just saying ‘oh you’ve got MS ‘ but then not showing any of the symptoms most people have to suffer through is so frustrating . I don’t watch Corrie but my mum does and has been filling me in. Totally irresponsible of the script writers. They had a chance to show this illness as it really is instead they have done the usual trick of forgetting about it!